One of the startling social changes of Gilded Age America was the increasing number of young women who attended colleges and universities. 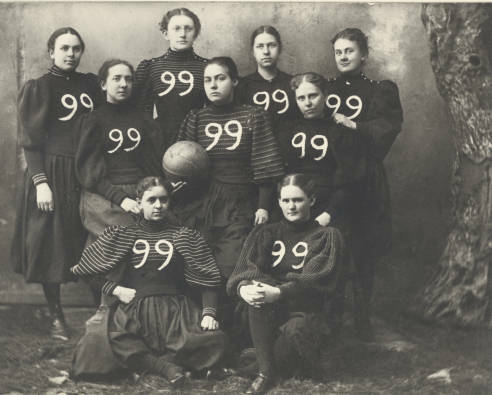 Though the most elite were the “Seven Sisters” established in the Northeast–Smith, Vassar, Wellesley, Mount Holyoke, Bryn Mawr, Barnard, and Radcliffe–dozens women’s colleges sprang up across the United States by the turn-of-the-century with the aim of providing middle-class young women with the necessary education for earning a living. These colleges were aware of the skepticism of higher education for women, as well as the burden of graduating young women who would prove the skepticism wrong, and operated much differently than traditional men’s colleges and even co-ed universities. First. The seriousness with which the college girl regards her course. Second. The thoroughly feminine consideration with which she regards her fellows. Regarding the former, nine-tenths of the girls at college are there for the purpose of fitting themselves to earn a livelihood. They are aiming to become professors, tutors, lawyers, doctors, litterateurs. They are not, generally, the daughters of wealthy parents. These go to a finishing school, and study the limitations, rather than the possibilities, of society. The female college students are mostly drawn from those medium walks of life wherein ambition is given impetus by necessity. The college girl does not give up four or five years of her life for the purpose of being called “college-bred,” as many of her brothers do; nor to gain admittance to an exclusive university club, or those circles to which a college education is the open sesame; nor “to humor the governor,” at a large cost per annum for indulging his whim. The college girl takes up her course because she loves it, and because it is the means to a much-desired end. It is this consideration for the feelings of others that gives to the girls’ colleges their distinctly feminine tone. From the raw, self-conscious days of the sub-freshman to the passing out of the senior, the girl collegian finds cordial greetings and ready sympathy every where. The “honor system” of self-government is in force at Vassar and several other colleges. According to this system, rules and regulations are abolished, and each girl pledges herself to retire at ten, with three exceptions each month if necessary; to attend chapel every day, and to take at least one hours’ exercise. In all the large colleges, there are committees appointed to take charge of the new arrivals, each girl meeting her protegée at the railway station, at t e n d in g to the details of her luggage, and not leaving her until she has seen her safely settled in the new quarters. The seniors usually have first choice of rooms, preferring to be located along the senior corridor, into which no lower classman dares venture, unless accompanied by a senior. Rooms are divided into suites of four sizes: fire walls, consisting of four bedrooms and parlor; parlors, consisting of three bedrooms and parlor; doubles, with two bedrooms and parlor, and singles, consisting of one room. When three or four girls who are congenial occupy a suite, their college association can be made most pleasant. Fitting up her quarters will be regarded by the freshman as the most serious work of the term’s beginning. She will catch glimpses of senior rooms, disclosing revelations on art from the college viewpoint— which has nothing to do with art by any other standard. Her own rooms—the bedroom containing bed, bureau, table and chair, the parlor a “parlor suite”—will look woefully barren; but she soon realizes how little is required to gain the popular effect—a few outré posters, inexpensive etchings and prints in dainty frames, flags of men’s colleges, class colors, field pennants, tennis rackets, riding-whips, foils, orders of dance, college cushions, a tabaret, an India seat, a tea-table, couch, spirit lamp and chafing-dish. All these things may be purchased at a shop in the college town whose proprietor can tell the wants of the freshmen better than they can themselves: or there will be advertisements on the bulletin-board, for sale or exchange. Often the members of the graduating class leave their room furnishings with “self-help” girls, to be disposed of on commission to incoming freshmen, who are very glad to get bargains. Meanwhile the freshman has chosen her hours for lectures and recitation—usually not more than four out of the eight hours, with two hours more for study. The hardest work of the college course comes in freshman year. Still there is time for relaxations and the forming of friendships. In September, or the early part of October, the sophomores formally welcome the freshman to college social life. The form of this entertainment varies at the different colleges. At Bryn Mawr the year is opened by a series of informal teas in honor of the freshmen, which give good opportunities for new acquaintances to the girl socially inclined. Next after these comes the “Presentation of Lanterns.” This fête has become a tradition at Bryn Mawr, and is a very pretty one. Each freshman is presented with a lantern to light her on her way through college, and some of the presentation speeches are very clever and full of local wit. Six weeks later the freshmen reciprocate, entertaining the sophomores with return speeches and toasts, and singing their class song, which until this time ‘has been closely guarded. It is on this occasion that the freshmen are mentally and socially engaged by the older fellows, who are looking out for worthy acquisitions to their societies. Wellesley’s “Floral Sunday” is an eloquent goodwill offering to the freshmen. The first Sunday after her arrival, each freshman finds at her breakfast plate a bunch of fragrant blossoms, tied with ribbons of the sophomore class color, with an accompanying card bearing the inscription, “Love one another, ” or “God is love, ’’ or whatever like theme has been chosen for the chapel address. On this morning the chapel is fragrant with flowers, the decorations being the result of sophomore effort and good will. Smith’s “Freshman Frolic” is a very pretentious affair. The dance is held in the “gym,” which has been transformed by boughs and blossoms, palms and vines, national flags and college emblems. Each soph constitutes herself a cavalier for the freshman to whom she is assigned. She sends her flowers, calls for her, fills her order of dance, introduces her partners, fetches ices and frappés between dances and takes her to supper. The whole method of procedure is apt to impress the freshman ludicrously at first, except that the soph fulfils her duties with so much dignified seriousness. Nor does the new order of things stop with the close of the dance. Every soph sees her partner home, begs for a flower and changes orders for souvenirs, and if the freshman has taken advantage of the opportunity and made the desired hit, there are dates for future meetings and jollifications, and a good-night over the balusters, as lingering and cordial as any the freshie has left behind her. And if the gallant soph who lives in another hall runs away from her shadow on the way back to her own dormitory, it’s nobody’s business but her own. Her duties in knight-errantry are at an end. At Vassar the girls go a step farther, those who fill men’s parts at the dances affecting bloomers, sack-coats disclosing a wide expanse of shirt-front, white lawn ties and buttonhole bouquets. By the time the freshman festivities are over, the upper classmen have judged the new stock, and desirable acquisitions are sought for the societies. These are legion, and they are the most fascinating phase of college life. First, but least exclusive, are the athletic societies; then the debating, literary, Shakespeare, dramatic, musical, historic, Greek letter;and, last but not least, the eating clubs. These last are the most exclusive societies at the girls’ colleges. They are purely social, and no one is admitted unless thoroughly desirable and unanimously elected. If a new girl is popular, several of these societies will try to get her. Hence there is considerable electioneering at the beginning of the term ; dining-rooms, recitation-rooms and class corridors become stamping-grounds for fair lobbyists, and the more persevering become regular little ward heelers. At the close of the first term, every one is located, and social life is at full blast. On Sunday evenings the dining-rooms are deserted, and the eating clubs hold sway. Alternately in the rooms of their members, the Nibblers, the Grubbers, the Epicureans, the Swallows, the Gobblers, the Friars, the Munchers, do wonderful things with spirit-lamps and chafing-dishes, accomplishing results delicious, savory, and more or less digestible. These Sunday evenings are dear to all college girls. At Wellesley, Monday is set apart as a holiday; but there is no record to show any connection with the eating clubs. The curriculum in girls’ colleges is not complete; but the ‘‘higher education” is still in its infancy. Meanwhile the natural womanly instinct asserts itself, and the chafing-dish holds sway over all small entertainments. No book-shelf is complete without a cookbook, and the natural rivalry between hostesses encourages experiment. The cozy dormitory quarters give an added flavor to fudge, rarebits, newburgs and afternoon teas, the last being the most popular. There is little work during the late afternoon hours. Between four and five-thirty the dormitories hum with gossip, and the tea-kettles make a lively tune. It is the general hour for relaxation, for the college girl arises early. The usual hour for the first bell is six-thirty, with breakfast from seven to eight. At Mt. 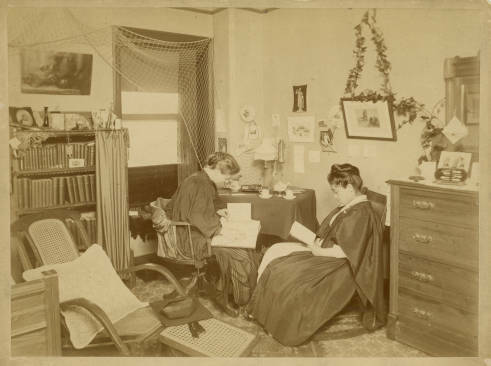 Holyoke the girls care for their own rooms, and in several of the dormitories at Smith’s and Wellesley the girls devote an hour each day to this sort of work in part payment for their board. At eight-thirty recitations begin, and the mornings are invariably busy. The day is divided into eight ‘‘hours,” and engagements made for first, second, third hour, et cetera, the time never being mentioned. Luncheon is usually from twelve to onethirty, after which the tension relaxes. During the afternoons the upper classmen find plenty of time for recreation. All the girls’ colleges have splendid gymnasiums, but they are not popular. Open-air athletics are greatly preferred, and there is no time in the year when some outdoor sport is not available. During the winter there are skating, tobogganing and long tramps, with basket-ball practice necessarily confined to the gymnasium. As soon as the frost is off the ground, however, the basket-ball teams revel in field practice, the rowing-machines are forsaken and the shells launched with a glad hurrah, and running records are broken and made on good turf track. College girls are very enthusiastic athletes. Basket-ball is the universal favorite sport, and there is a general struggle to get on the teams. There are many other sports, and all have their devotees—tennis, golf, lacrosse, swimming, riding, cycling, vaulting, highjumping and running events. Tramping, too, is a favorite pastime, and in many of the colleges “Mountain Day” is set apart for this purpose. At Mt. Holyoke the girls are great equestrians, and the objective points of their “little jaunts” and “constitutionals” are located eight and ten miles from the college-grounds. 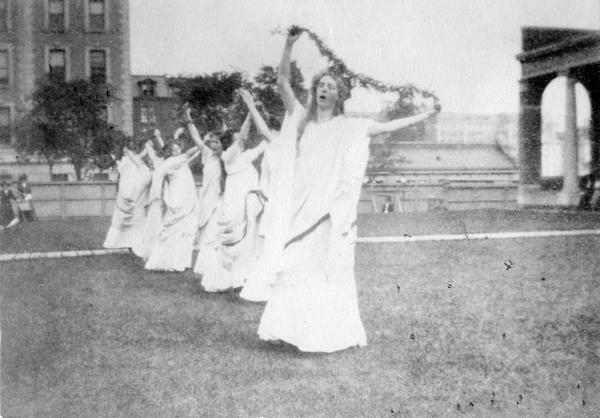 As the Vassar and Smith girls look back to Chapter House dances and “Phil Proms,” so the Mt. Holyoke graduate cherishes tender memories of the Bluffs, the Larches, Titans’ Pier, the Pass of Thermopylae, Paradise, and Bittersweet Lane. “Field Day” at the colleges is the culmination of the year’s athletic work. It is always a gala day, and class spirit runs high. Vassar’s “Field Day,” occurring in May, is the most exciting event of the year. She has always maintained high records in track events, and the record-breakers of “Field Day” are exalted and fêted by their colleagues. Hooray! Hooray for the gray! Hooray! Hoorah for Bryn Mawr! which is the favorite college cry, having been dedicated to President Taylor, who belonged to the Society of Friends. Besides these annual athletic celebrations, there are regular fête-days observed by every college. At Vassar there are “Founders’ Day” and “‘Philolethian Day,” terminating with formal dances in the evening, and there is the annual trip to Lake Mohonk, a treat provided by “Uncle Fred” Thompson, one of the trustees. “Float Day” is a fête peculiarly Wellesley’s own. The festivities begin at sunset, with the coming out of the floats decorated and fashioned in quaint design, sometimes suggestive of class jokes, sometimes bearing upon the eccentricities of the faculty, sometimes carrying out a theme in history or drama. Smaller craft follow the floats, until, as twilight deepens, Lake Waban is covered with a gay flotilla, hundreds of colored lights on the boats adding beauty to the scene. On shore, scores of lanterns hung in the trees transform the place to a veritable fairyland. The grounds are filled with guests, refreshments are served, fireworks make things brilliant, and then, in the first lull, the Wellesley college songs break out over the moonlit stillness, and “Wellesley, Our Alma Mater,” floats over the hills, eight hundred voices strong. The “Freshman Banquet” is the event of the year at Wellesley College, the “Junior Promenade” at Smith’s, and “Mountain” is sacred to Mt. Holyoke, when the whole college takes a holiday, the seniors monopolizing one of the mountain inns, where grinds and prophecies are read, old books burnt, toasts drunk over the bonfire in deep flagons of lemonade, and a pair of fiddlers engaged for a dance that lasts until midnight. After the beginning of the second term, the seniors come into prominence. Preparations for commencement and class day exercises are put under way; farewell entertainments are given by the under classmen; the year’s dramatics, which have been a very popular part of the entertainment— and sometimes dangerously fascinating—are drawn to a close, and the seniors prepare to leave their alma mater. Almost invariably they are sorry to go, for the association of four or five years must result in ties and bonds not easy to break. The senior supper, which is the last event of college life before the public exercises, is intended for a huge jollification; but it puts lumps in girls’ throats not so easily swallowed as the goodies specified on the menu. Here speeches are made which, despite the bright quips and witty allusions to incidents of college life, strike chords of deep feeling. 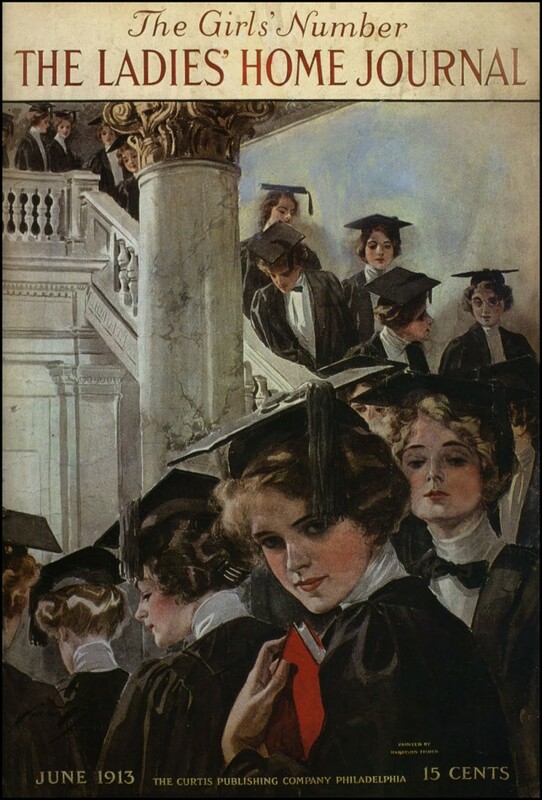 In some of the colleges it is the rule for engaged girls to “own up” and receive the congratulations of their classmates; in others souvenirs are exchanged which will always remain treasured tokens; and at Bryn Mawr it is the custom of the lower classmen, who refuse to allow the occasion to be steeped in tears, to gather underneath the windows and sing class songs and shout class calls, until the seniors soften and pass out goodies through the windows. Then come class day and commencement exercises, with their attendant excitement and pleasure—the receiving of degrees, with a justifiable flush of pride and satisfaction; the parting with chums and familiar landmarks, with the inevitable gulp and struggle for self-control; and then Stern reality.